The pulmonary circulation consists of the pulmonary trunk, which extends from the right ventricle and divides into right andleft pulmonary arteries. The right pulmonary artery is wider and longer than the left. Each artery enters the hilum of the lung, where it further divides into smaller branches. The left pulmonary artery is attached to the aorta through the ligamentum arteriosum, a fibrous remain of ductus arteriosus. If the ductus arteriosus remains patent after birth, this condition is known as patent ductus arteriosus (PDA). In this case, the deoxygenated blood bypasses the lung and enters directly into the aorta. Babies with PDA are cyanosed and need an urgent medical or surgical intervention. Pulmonary veins arise from each lobe of the lung. The veins from the right upper and middle lobe unite, and a total of four pulmonary veins enter the left atrium. 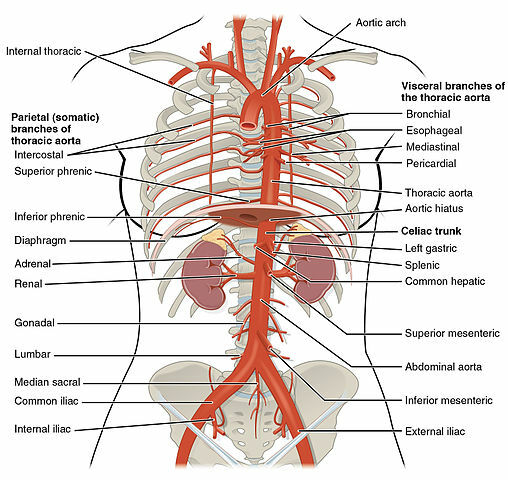 The systemic blood vessels present in the thorax include: aorta, brachiocephalic trunk, brachiocephalic veins, superior and inferior vena cava, azygous vein and the vertebral veins. These are discussed individually, below. 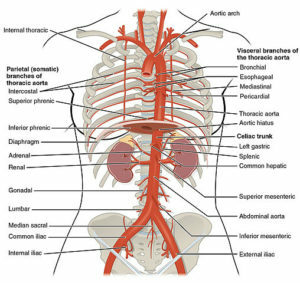 The aorta is the largest artery in the human body. It is divided into three major parts: the ascending aorta, the arch of aorta, and the descending aorta. The part of the descending aorta within the thorax is known as thoracic aorta. The ascending aorta gives off right and left coronary arteries. It ascends up to the level of sternal angle. Brachiocephalic trunk which divides into the right carotid artery and the right subclavian artery. The right subclavian artery may also arise from the descending aorta and lies posterior to the esophagus. This may lead to dysphagia (difficulty in swallowing). The thoracic aorta is situated in the posterior mediastinum. It crosses the diaphragm to become the abdominal aorta. In the thorax, it gives off parietal and visceral branches. The internal and external jugular vein, the vertebral vein and the subclavian vein drain into the brachiocephalic vein on each side. The right brachiocephalic vein has a vertical orientation while the left brachiocephalic vein lies obliquely. Both of them drain into the superior vena cava. The superior vena cava receives the azygous vein and ends in the right atrium. The inferior vena cava receives blood from the lower part of the body and empties into the right atrium. The azygous vein receives blood from smaller veins on each side of the vertebral column, draining the back of the thorax. 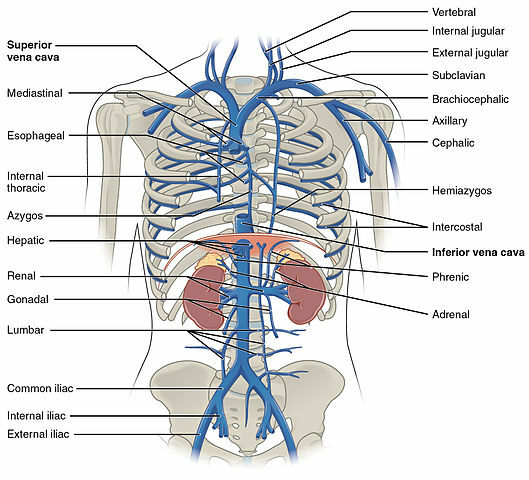 The hemiazygous vein, accessory vein and a number of posterior intercostal veins also drain into the azygous vein, as shown in the figure below. The vertebral venous system comprises venous plexuses, which drain the back and the components of the vertebral canal. These are valveless veins, which communicate with intracranial veins above and portal veins below. The blood can flow in either direction and is the main reason for tumor spread.